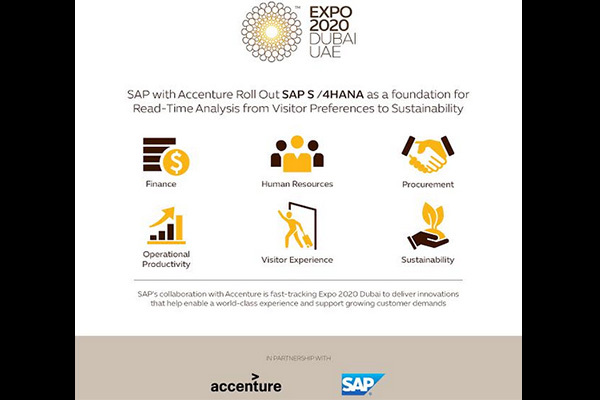 Professional services company Accenture, in collaboration with SAP, has implemented SAP S/4HANA for Expo 2020 Dubai to provide the event with a foundation for data-driven insights, from visitor preferences to sustainability. The new digital platform transforms back-office and visitor-facing capabilities for the global mega event, which is expected to host 25 million visits over 6 months from October 2020. Expo 2020 Dubai went live with SAP S/4HANA in only seven months. SAP S/4HANA is a real-time enterprise resource planning suite for digital business, built on an advanced in-memory platform, SAP HANA, and offers a personalized, consumer-grade user experience with SAP Fiori. The new platform will allow Expo 2020 Dubai to better source its needs, manage financials, and enlist talent instantly and seamlessly. The platform will later support visitor-facing capabilities that can transform the experience for millions of visitors from around the world. Accenture’s collaboration with SAP is fast-tracking Expo 2020 Dubai to deliver innovations that help enable a world-class experience and support growing customer demands. For example, the finance, procurement and human resources processes across the Expo 2020 Dubai organization have been modernized and integrated on to a single platform, bringing increased speed and agility to operational productivity.